Mounts Botanical Garden is the oldest and largest public botanical gardens in the Palm Beaches, and walking its nature trails is a great way to enjoy the setting. However, Mounts also offers plenty of more unusual activities, including an upcoming cooking demonstration that will be held as part of its Tropical Fruit Festival on Saturday, June 25, 10 a.m. Chef Allen Susser, recipient of the coveted James Beard Award as Best Chef in the Southeast and the author of several best-selling cookbooks, will lead the demonstration. He will discuss how to cook with some of the tropical fruits that are so abundant throughout South Florida, including mangoes, bananas and papayas. Participants will also have the opportunity to sample many of the fruits, attend a lecture on growing tropical fruits, and purchase fruit trees. 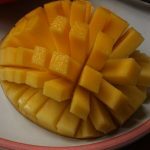 If you have an interest in tropical fruit, this is the ideal event. For more information, contact Mounts Botanical Garden, 561-233-1757, 531 North Military Trail, West Palm Beach.